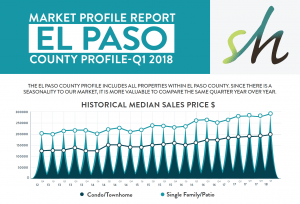 The Colorado Springs Real Estate Market has wrapped up its final quarter for 2018. As expected the Q4 numbers show their seasonality by coming in slightly lower than Q3. New construction is still booming across areas of Colorado Springs and overall 2018 was a very good year in real estate. Click below to read the entire market report. With the beginning of the new year, we also tend to look ahead to 2019 and speculate as to what the new year may bring. We asked several of our agents to analyze the performance of certain market statistics and give a prediction as to what a buyer or seller might expect to see for 2019. Check out our informative video so that you can see if buying or selling is right for you in 2019. Springs Homes has been producing market reports for Colorado Springs since 2010. The benefit of reading through these reports is to gain an understanding of the current market to see trends and to be able to predict what is coming up in the future. 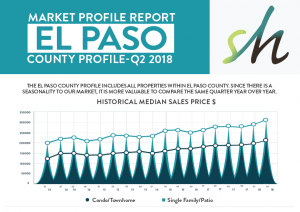 Whether you are a home seller, or a home buyer, these market reports will give you an in depth understanding of the Colorado Springs market by area and price point which will give you an edge when heading toward your next sale or purchase of a home.